I am interested in what the best ways are to keep your face and feet warm. I saw some shoe covers on amazon, but they all seem to require you to be riding clipless which I do not. I think if I used a shoe cover, the bottom of it would get all ripped up by the teeth of my pedals. The face is another challenge I have. I usually like to use biking glasses, but recently I started using a balaclava which covers my nose and mouth. As soon as i started breathing my biking glasses started fogging up! Is there a balaclava solution that works with glasses? I recommend ski googles and Seirus "Masque" over a balaclava. This mask only covers the bottom half of your face, and can be paired with merino wool hat worn underneath a helmet. This is more versatile, as you can remove the mask, but still wear the hat off-bike. I also use a scarf underneath my jacket to make sure there's a good seal to keep the wind out. 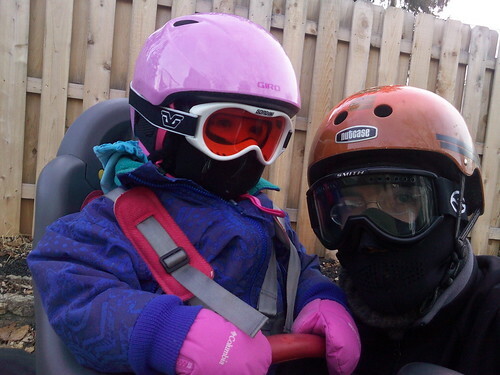 For my kids, I still use a balaclava for simplicity on very cold days. For keeping your feet warm, I recommend NEOS overshoes. They go over your normal shoes, keeping your shoes and pant legs dry and clean. Even the non-insulated options add warmth due to the layering. I like the Voyager model, which is also light and packable. I have another number of other winter cycling articles on my blog if you'd like to read more about my experiences and gear. The balaclava is definitely the way to keep your face warm. Try spraying your glasses with some anti fog spray to solve the breath problem. If you aren't willing to give up the abrasive pedals, you should just get some actual boots. You ask about a balaclava - I can highly recommend the Assos facemask. The downside of this will be the price, but as with anything Assos make, the quality is the best on the market (imo). This is my second winter with mine and last year was fine. Note from the photo in the link the loops above the ears....for your glasses. But I think if you ride with both nose and mouth covered a certain amount of fogging is inevitable. Personally I hate the feeling of having something over my nose or my mouth so always have the bottom between chin and mouth, if you see what I mean. You also mention booties. There are lots out there offering thermal properties, but I think you are right about wear and tear. I cycle at either end of a train journey. At one end (country roads) I use clipless pedals, at the other end (big city) I use flat pedals. The flat pedals most definitely cause wear and tear. My solution? Nothing fancy I'm afraid - I stump up for a new pair every year. A pair of skiing goggles is my non-fogging option when it is really cold and/or snowing. Most models have vents that help air circulation along the glass and a coating that keeps them from fogging. The larger space between the glass and your face helps, so get big ones. When it isn't too cold, and there is no chance of snow I just skip the eye-protection. I've worn Scott skiing goggles and never had peripheral vision problems, just be sure not to wear tinted in the dark. Really helped with wet sloggy winter commutes to Seattle. Wool sweaters and socks work when wet, which can be either rain or sweat. Also have a nice gore-tex helmet cover. Remember the old adage: if your feet are cold, put on a hat. Keep your head warm, and you will have less trouble with your feet. When it gets really cold (or it is cold AND wet) I wear a pair of neoprene socks designed to keep kayaker's feet warm. I wear these over a pair of thin wool or acrylic socks, UNDER my shoes. I am primarily a mountain biker, and this seems much more reliable to me than the shoe covers that slip over, because of the chance of tearing the cover on something. I think the socks I have are something like these: http://www.rei.com/product/722203/nrs-hydroskin-socks. There are thicker models available but I prefer wearing the thin ones over the wool because it allows me to wear the neoprene ones many times before they need a wash. The coldest I've ridden with this combination was probably about 20 degrees with a few inches of snow on the ground and a couple of stream crossings, and while my shoes were soaked my feet felt great. Ski goggles with double paned lenses with a wide field of vision are best for winter if fog is an issue. The double panes help avoid condensation due to the air barrier between the lenses (and the fact that most double pane goggles also have anti-fog treatment helps as well). Additionally, they are more enclosed, which keep your eyes from tearing up due to the chilling air at very low temperatures. Some ski goggles have really terrible peripheral vision though, so shop around. For warmer days, I tend to use MSA Safety Works safety goggles with anti fog coating that work well and have good peripheral coverage without obscuring my vision. They sit far enough off my face that they prevent fog when I'm stopped. Wool balaclavas are good to protect your ears and neck, while being breathable enough to stop you from sweating too much. You have to see what works for you for setup of the balaclava, sometimes it can direct your breath from your nose up in to your glasses or goggles. Some people leave their nose exposed. Some people prefer a neoprene mask for face protection instead. Bern helmets or other less vented commuter helmets such as nutcase or giro reverb tend to work well in winter time since they don't have as much extreme airflow. 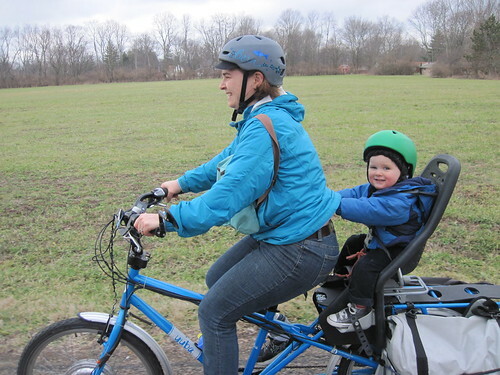 For regular helmets, you can tape over vents or get helmet rain covers to reduce the chilling effect. 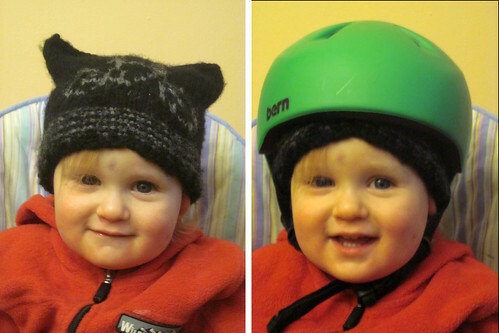 I prefer to use a bern watts helmet with a smartwool balaclava. As far as shoes, If you prefer not to wear cycling shoes, then boots with wool socks (no synthetic or cotton in really cold weather) and platform pedals are the best option. You can add supplemental heat with chemical toe warmers or insoles (I prefer the insoles). You can also add windproof overboots to your current setup if you're still too cold. Ski Gloves or Lobster Mitts (looks like 2 double wide fingers and thumb) are good for drop bar setups, but if you have flat bars you might even be able to get away with full mittens. Gloves with a breathable, but windproof shell is preferred. I often use ski gloves with hand warmer pockets, so that I can use chemical hand warmers on really cold days. Seal Skins makes a thermal, waterproof sock that I've used for years. Sure my shoes get wet, but my feet and regular socks stary warm and dry, plus there's no problem clicking into my pedals or sliding into toeclips. I do not know whether this was intended, but all mentioned only passive systems to keep your feet warm. Going like 25 kms one way, I use electrical soles and for longer trips, heating pads that generate heat from a carbon-metal powder. If you do not exert pressure, another active system are heating pads filled with some acetic acid(?). Obviously, you should not use these between your feet and the pedals. Here, a phase transition from liquid to solid generates heat. You can reuse those by reheating in a water bath until the solid becomes liquid again. Of course, all of these measures are improved by good insulation. I've never had peripheral vision problems with good skiing googles. Another tip that works for me is to do everything to be able to go fast and become warm from the exercise, e.g. using spike tires. Most of the question has already answered, but I would like to look at something else - how to keep the body and arms warm. Obviously, putting aside arm warmers, the best way to keep warm is not to bother with the expensive cycling jackets, good though they are. These will never totally keep out the cold particularly if your ride a road bike and go somewhat faster. Therefore, get a cheap cycling rain mac and wear it UNDERNEATH your main cycling jacket. This means it will hug the body and keep the warmth in. However, if you are REALLY fast and the sun comes out, it won't let your body breath. But try it in really cold weather. When rainy, wear the gloves such that the jacket sleeve(cuff) covers the end of the glove near your wrist, think of it as tucking your glove inside of your cuff. I realized this as my hands and gloves are wet and cold as rain trickled down into my gloves from my shoulders; 60 miles into my first century ride. there are winter-specific shoes like Shimano MW80, Northwave Celsius etc. you need all of the body to be insulated and warm. In cold, body prioritizes bloodflow to vital internal organs over extremities. So if your core is losing warmth, body will work on that, and feet will get cold sooner. In addition to proper clothing, what worked for me was to carry a bottle of warm (but not boiling hot) tea underneath my jacket. As Pēteris Caune's answer suggests, it is important to keep the vital organs warm, otherwise the body will reduce blood flow to limbs. If the chest is warm, the heart will pump warm blood into the whole body. It worked well for a 1-2 hour ride. You can take a sip from time to time. 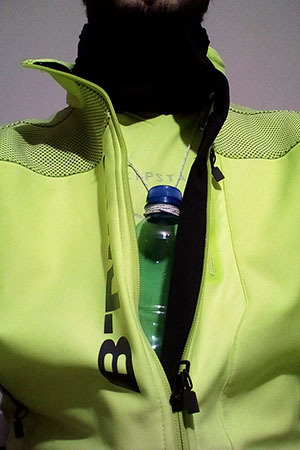 I tied the bottle with a string around my neck, because I don't have pokets on the inside. Not the answer you're looking for? Browse other questions tagged clothes winter or ask your own question. What to put on or inside winter-SPD-boots to keep toes warm?